Pentosin CHF 202 is a synthetic high performance hydraulic fluid for life-time application in modern vehicle aggregates. 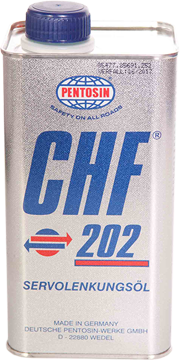 Pentosin CHF 202 is especially designed for hydraulics in the automotive industry with the highest technical requirements such as: power steering, clutch hydraulic, electro-hydraulic mechanisms of convertible tops, etc. It is suitable for all extreme ambient temperatures and guarantees full performance from -40°C to 130°C system temperature.